dark in the basket’s bowl. you go on gathering till morning. from her tangled nest near the top. of soap root over earth-caked skin. If you could only hear. sinking in these blue waters. place that fills, but is empty. never held in the hand place. Oh river. This is your sweet mouth. Dry sand waiting to be run through. My series of “correspondences” is a communication with aspects of the natural world, including my body, my garden, and the mountains and wilderness closest to me. Text and messages found in the scrawl of branches, the letters of leaf and trail write us back into an ecologic language of place. I spend a lot of time listening for this language—naming and identifying plants and animals as a naturalist would, but also listening for what can never be named— to create a sense of kinship. At some point, though, my attention to the outer world turns me back to rhythms of loss and renewal within myself. Water and the way its presence and absence shape the landscape, forming a geography of its movement and containment, is an ever present part of life in the high desert. More and more, I am seeing how these features shape my inner life, as well. Kyce Bello edited The Return of the River: Writers, Scholars, and Citizens Speak on Behalf of the Santa Fe River (Sunstone Press, 2011), an anthology of literary ecoactivism which received two New Mexico book awards. 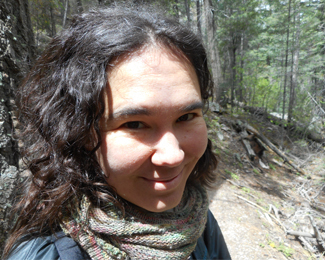 Of Cuban, Puerto Rican, and Anglo descent, she is an MFA candidate at the Institute of American Indian Arts. Her poems have recently been published or are forthcoming in Written River Journal of Ecopoetics, Taproot, Sonora Review, and elsewhere. She lives under a very old apple tree in Santa Fe, with her husband and two daughters, and writes occasionally about their days at Old Recipe for a New World.